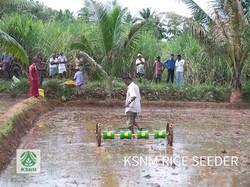 Rice Seeders are meant for sowing germinated paddy in wetland paddy field. 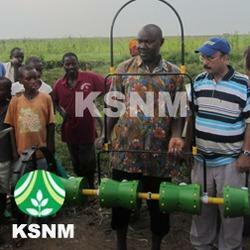 Its manually operated implement. It saves labour cost drastically. 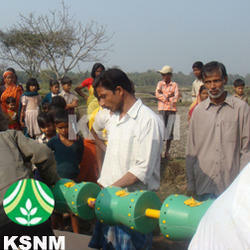 Seed Sowing Machine is for sowing germinated paddy seed directly in wetland field. There is no need for transplantation. It is a manually pulled implement. It covers 8 rows of 20cm row-to-row spacing at a time. It is made up of plastic materials. With an aim to fulfill the wide needs of the agricultural sector, we are affianced in offering supreme quality Seed Sowing Machine that is a gardening equipment used to plant rice seeds. It is designed & manufactured using the finest quality components and sound techniques under the supervision of skilled professionals. To ensure its flawlessness at clients' end, the offered Seed Sowing Machine is tested on various parameters by our quality controllers prior to dispatching the delivery from our end. 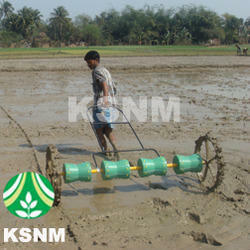 Drum Seeder is for sowing germinated paddy seed directly in wetland field. There is no need for transplantation. It is a manually pulled implement. It covers 8 rows of 20cm row-to-row spacing at a time. It is made up of plastic materials. 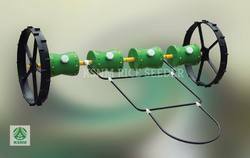 With an aim to fulfill the wide needs of the agricultural sector, we are affianced in offering supreme quality Drum Seeder that is a gardening equipment used to plant rice seeds. It is designed & manufactured using the finest quality components and sound techniques under the supervision of skilled professionals. To ensure its flawlessness at clients' end, the offered Drum Seeder is tested on various parameters by our quality controllers prior to dispatching the delivery from our end. 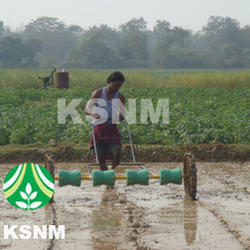 Row Seeder is for sowing germinated paddy seed directly in wetland field. There is no need for transplantation. It is a manually pulled implement. It covers 8 rows of 20cm row-to-row spacing at a time. It is made up of plastic materials. With an aim to fulfill the wide needs of the agricultural sector, we are affianced in offering supreme quality Row Seeder that is a gardening equipment used to plant rice seeds. It is designed & manufactured using the finest quality components and sound techniques under the supervision of skilled professionals. To ensure its flawlessness at clients' end, the offered Row Seeder is tested on various parameters by our quality controllers prior to dispatching the delivery from our end. 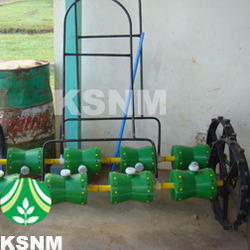 Agriculture Plastic Drum Seeder is for sowing germinated paddy seed directly in wetland field. There is no need for transplantation. It is a manually pulled implement. It covers 8 rows of 20cm row-to-row spacing at a time. It is made up of plastic materials. With an aim to fulfill the wide needs of the agricultural sector, we are affianced in offering supreme quality Agriculture Plastic Drum Seeder that is a gardening equipment used to plant rice seeds. It is designed & manufactured using the finest quality components and sound techniques under the supervision of skilled professionals. To ensure its flawlessness at clients' end, the offered Agriculture Plastic Drum Seeder is tested on various parameters by our quality controllers prior to dispatching the delivery from our end. 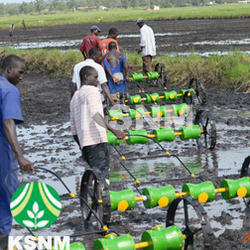 Seeding Equipment is for sowing germinated paddy seed directly in wetland field. There is no need for transplantation. It is a manually pulled implement. It covers 8 rows of 20cm row-to-row spacing at a time. It is made up of plastic materials. With an aim to fulfill the wide needs of the agricultural sector, we are affianced in offering supreme quality Seeding Equipment that is a gardening equipment used to plant rice seeds. It is designed & manufactured using the finest quality components and sound techniques under the supervision of skilled professionals. To ensure its flawlessness at clients' end, the offered Seeding Equipment is tested on various parameters by our quality controllers prior to dispatching the delivery from our end. 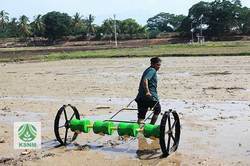 Plastic Drum Seeder is for sowing germinated paddy seed directly in wetland field. There is no need for transplantation. It is a manually pulled implement. It covers 8 rows of 20cm row-to-row spacing at a time. It is made up of plastic materials. With an aim to fulfill the wide needs of the agricultural sector, we are affianced in offering supreme quality Plastic Drum Seeder that is a gardening equipment used to plant rice seeds. It is designed & manufactured using the finest quality components and sound techniques under the supervision of skilled professionals. To ensure its flawlessness at clients' end, the offered Plastic Drum Seeder is tested on various parameters by our quality controllers prior to dispatching the delivery from our end. 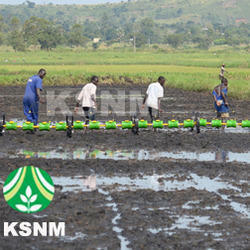 Wetland Manual Operating Seeding Machine is for sowing germinated paddy seed directly in wetland field. There is no need for transplantation. It is a manually pulled implement. It covers 8 rows of 20cm row-to-row spacing at a time. It is made up of plastic materials. With an aim to fulfill the wide needs of the agricultural sector, we are affianced in offering supreme quality Wetland Manual Operating Seeding Machine that is a gardening equipment used to plant rice seeds. It is designed & manufactured using the finest quality components and sound techniques under the supervision of skilled professionals. To ensure its flawlessness at clients' end, the offered Wetland Manual Operating Seeding Machine is tested on various parameters by our quality controllers prior to dispatching the delivery from our end. 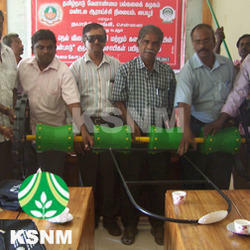 Hand Operated Seeding Machine is for sowing germinated paddy seed directly in wetland field. There is no need for transplantation. It is a manually pulled implement. It covers 8 rows of 20cm row-to-row spacing at a time. It is made up of plastic materials. With an aim to fulfill the wide needs of the agricultural sector, we are affianced in offering supreme quality Hand Operated Seeding Machine that is a gardening equipment used to plant rice seeds. It is designed & manufactured using the finest quality components and sound techniques under the supervision of skilled professionals. To ensure its flawlessness at clients' end, the offered Hand Operated Seeding Machine is tested on various parameters by our quality controllers prior to dispatching the delivery from our end. 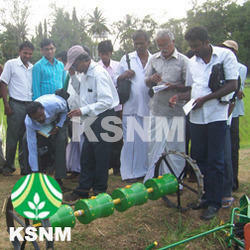 Manual Operated Seeding Machine is for sowing germinated paddy seed directly in wetland field. There is no need for transplantation. 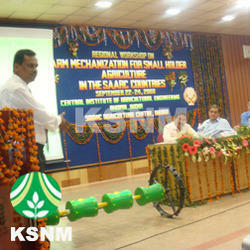 It is a manually pulled implement. It covers 8 rows of 20cm row-to-row spacing at a time. It is made up of plastic materials. With an aim to fulfill the wide needs of the agricultural sector, we are affianced in offering supreme quality Manual Operated Seeding Machine that is a gardening equipment used to plant rice seeds. It is designed & manufactured using the finest quality components and sound techniques under the supervision of skilled professionals. To ensure its flawlessness at clients' end, the offered Manual Operated Seeding Machine is tested on various parameters by our quality controllers prior to dispatching the delivery from our end. 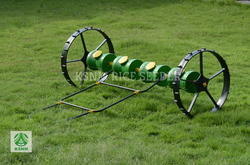 8 Row Handy Plastic Drum Seeder is for sowing germinated paddy seed directly in wetland field. There is no need for transplantation. It is a manually pulled implement. It covers 8 rows of 20cm row-to-row spacing at a time. It is made up of plastic materials. With an aim to fulfill the wide needs of the agricultural sector, we are affianced in offering supreme quality 8 Row Handy Plastic Drum Seeder that is a gardening equipment used to plant rice seeds. It is designed & manufactured using the finest quality components and sound techniques under the supervision of skilled professionals. To ensure its flawlessness at clients' end, the offered 8 Row Handy Plastic Drum Seeder is tested on various parameters by our quality controllers prior to dispatching the delivery from our end. 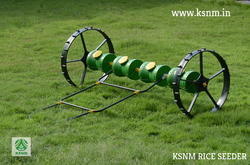 8 Row Handy Wetland Seeder is for sowing germinated paddy seed directly in wetland field. There is no need for transplantation. It is a manually pulled implement. It covers 8 rows of 20cm row-to-row spacing at a time. It is made up of plastic materials. 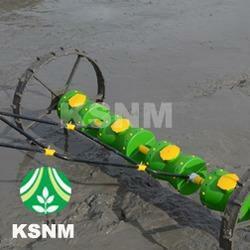 With an aim to fulfill the wide needs of the agricultural sector, we are affianced in offering supreme quality 8 Row Handy Wetland Seeder that is a gardening equipment used to plant rice seeds. It is designed & manufactured using the finest quality components and sound techniques under the supervision of skilled professionals. To ensure its flawlessness at clients' end, the offered 8 Row Handy Wetland Seeder is tested on various parameters by our quality controllers prior to dispatching the delivery from our end. 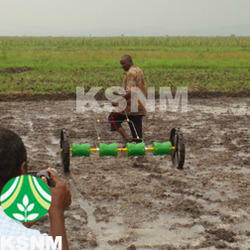 Agriculture Seeder is for sowing germinated paddy seed directly in wetland field. There is no need for transplantation. It is a manually pulled implement. It covers 8 rows of 20cm row-to-row spacing at a time. It is made up of plastic materials. 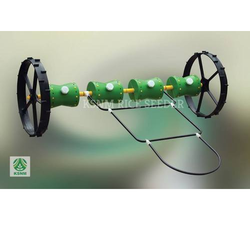 With an aim to fulfill the wide needs of the agricultural sector, we are affianced in offering supreme quality Agriculture Seeder that is a gardening equipment used to plant rice seeds. It is designed & manufactured using the finest quality components and sound techniques under the supervision of skilled professionals. To ensure its flawlessness at clients' end, the offered Agriculture Seeder is tested on various parameters by our quality controllers prior to dispatching the delivery from our end. 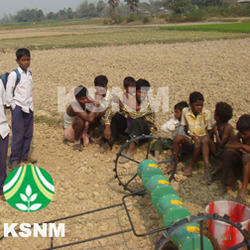 Agriculture Seeding Equipment is for sowing germinated paddy seed directly in wetland field. There is no need for transplantation. It is a manually pulled implement. It covers 8 rows of 20cm row-to-row spacing at a time. It is made up of plastic materials. With an aim to fulfill the wide needs of the agricultural sector, we are affianced in offering supreme quality Agriculture Seeding Equipment that is a gardening equipment used to plant rice seeds. It is designed & manufactured using the finest quality components and sound techniques under the supervision of skilled professionals. To ensure its flawlessness at clients' end, the offered Agriculture Seeding Equipment is tested on various parameters by our quality controllers prior to dispatching the delivery from our end. 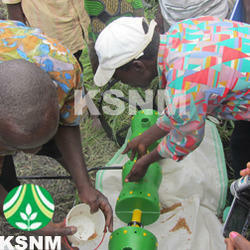 Improved Seeder is for sowing germinated paddy seed directly in wetland field. There is no need for transplantation. It is a manually pulled implement. It covers 8 rows of 20cm row-to-row spacing at a time. It is made up of plastic materials. With an aim to fulfill the wide needs of the agricultural sector, we are affianced in offering supreme quality Improved Seeder that is a gardening equipment used to plant rice seeds. It is designed & manufactured using the finest quality components and sound techniques under the supervision of skilled professionals. To ensure its flawlessness at clients' end, the offered Improved Seeder is tested on various parameters by our quality controllers prior to dispatching the delivery from our end. 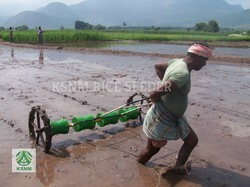 Manual Rice Seeder is for sowing germinated paddy seed directly in wetland field. There is no need for transplantation. It is a manually pulled implement. It covers 8 rows of 20cm row-to-row spacing at a time. It is made up of plastic materials. 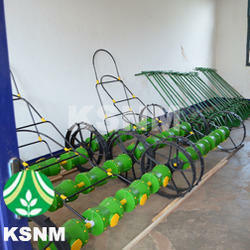 With an aim to fulfill the wide needs of the agricultural sector, we are affianced in offering supreme quality Manual Rice Seeder that is a gardening equipment used to plant rice seeds. It is designed & manufactured using the finest quality components and sound techniques under the supervision of skilled professionals. To ensure its flawlessness at clients' end, the offered Manual Rice Seeder is tested on various parameters by our quality controllers prior to dispatching the delivery from our end. 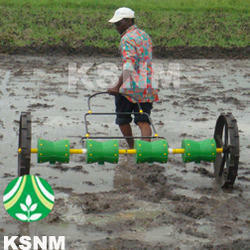 Manual Seeder is for sowing germinated paddy seed directly in wetland field. There is no need for transplantation. It is a manually pulled implement. It covers 8 rows of 20cm row-to-row spacing at a time. It is made up of plastic materials. 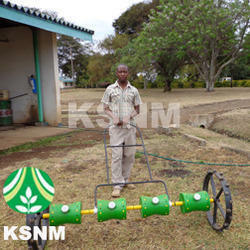 With an aim to fulfill the wide needs of the agricultural sector, we are affianced in offering supreme quality Manual Seeder that is a gardening equipment used to plant rice seeds. It is designed & manufactured using the finest quality components and sound techniques under the supervision of skilled professionals. To ensure its flawlessness at clients' end, the offered Manual Seeder is tested on various parameters by our quality controllers prior to dispatching the delivery from our end. 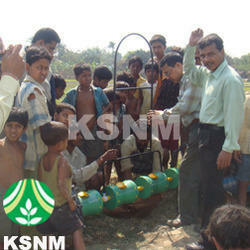 Seed Drill Machine is for sowing germinated paddy seed directly in wetland field. There is no need for transplantation. It is a manually pulled implement. It covers 8 rows of 20cm row-to-row spacing at a time. It is made up of plastic materials. With an aim to fulfill the wide needs of the agricultural sector, we are affianced in offering supreme quality Seed Drill Machine that is a gardening equipment used to plant rice seeds. It is designed & manufactured using the finest quality components and sound techniques under the supervision of skilled professionals. To ensure its flawlessness at clients' end, the offered Seed Drill Machine is tested on various parameters by our quality controllers prior to dispatching the delivery from our end. 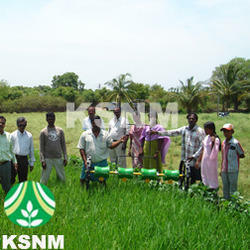 TNAU Paddy Seeder is for sowing germinated paddy seed directly in wetland field. There is no need for transplantation. It is a manually pulled implement. It covers 8 rows of 20cm row-to-row spacing at a time. It is made up of plastic materials. 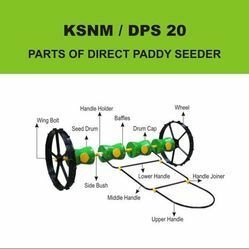 With an aim to fulfill the wide needs of the agricultural sector, we are affianced in offering supreme quality TNAU Paddy Seeder that is a gardening equipment used to plant rice seeds. It is designed & manufactured using the finest quality components and sound techniques under the supervision of skilled professionals. To ensure its flawlessness at clients' end, the offered TNAU Paddy Seeder is tested on various parameters by our quality controllers prior to dispatching the delivery from our end.